Arabian Oryx (Oryx leucoryx) are endemic to the Arabian Peninsula, with a historically range across Oman, Saudi Arabia, Jordan, United Arab Emirates, Yemen, Kuwait and Iraq. They are the largest of the antelopes in the region and are extremely well adapted to the extremely arid environment and are culturally significant. For these reasons they were reintroduced into the Dubai Desert Conservation Reserve (DDCR), an area of 225 km² in the emirate of Dubai in the UAE. The area is characterized by sand dunes interspersed with gravel plains. The reintroduction project aim at providing a viable breeding population of Arabian Oryx, within a diverse desert landscape, that could be observed by visitors to the DDCR. Initially 118 individuals were released into the Al Maha Reserve and provided with supplementary feed, artificial shelter and water, in order to encourage the stated aims of having a breeding population and of increasing the biodiversity of the reserve. At the end of 2003 and in March 2004 established herds of 17 and 24 respectively were translocated into separate locations in the northern area of the DDCR. A further release in April 2005 was done by moving one of the feeding stations from the AMR into the DDCR. The separation of the AMR and the DDCR is now more permeable allowing Oryx to move freely between the two areas and this has lead to the natural formation of free ranging herds of Oryx. 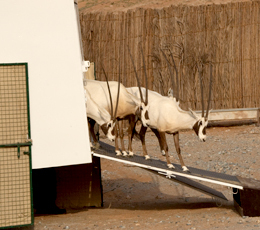 As of May 2008 approximately 270 Arabian Oryx occur within the DDCR of which approximately 50 are independent of supplementary feed or artificial shelters. The reintroduction has not impacted of the biodiversity of the DDCR. In fact there has been and continues to be an improvement in flora and fauna within the reserve. Over 200 000 people visited the DDCR in 2007 through good practice and education of tour operators this is being done in a sustainable manner.